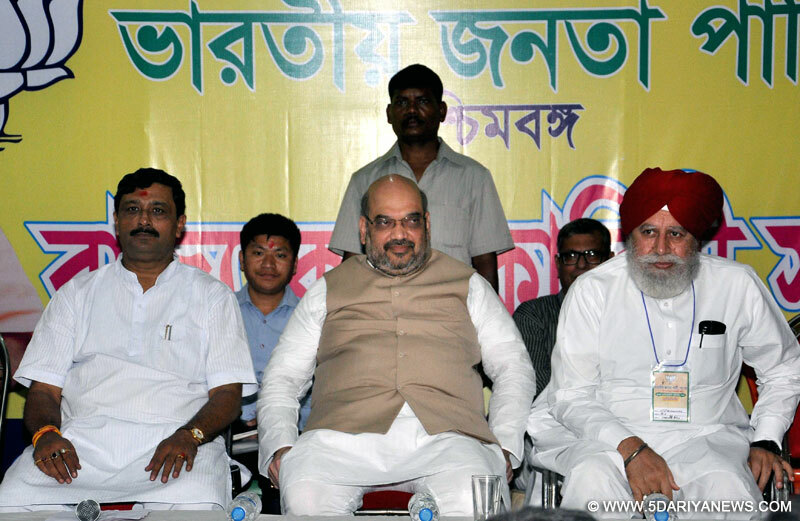 Accusing the Trinamool Congress of being involved in the Saradha scam, BJP president Amit Shah Sunday asserted the central government was not afraid of anybody in bringing the guilty to the books.Addressing a party rally here for the first time after taking over the party's reins as its president, Shah launched a scathing attack on the Mamata Banerjee-led government over a host of issues, including illegal Bangladeshi immigrants. "When a few thousand farmers lost their land in Singur and Nandigram, Didi (Banerjee) had fasted for days. But now that 17 lakh poor people have lost their deposits to the Saradha scam, why don't you now feel like fasting?" "You are not fasting because it's your cronies who are involved in the scam," said Shah. "Can Didi stop those who have taken the money? The answer is no, but we are not afraid of anybody because our workers have not done any scam. So, be it Saradha or any other, we will net whoever is involved," added Shah.Shah's comments come at a time when the CBI, probing the multi-crore scam, has interrogated several high-profile names and has again taken the custody of suspended Trinamool MP Kunal Ghosh. Ghosh, who headed Saradha's media arm, Saturday claimed it was Banerjee who benefited most from the Saradha media and urged he be interrogated with Banerjee and scam kingpin Sudipta Sen.